Source: CICH graphic created using data adapted from Statistics Canada, Canadian Vital Statistics, Birth and Death Databases and population estimates. CANSIM table 102-0512 http://www5.statcan.gc.ca/cansim/a26?lang=eng&retrLang=eng&id=1020512&&pattern=&stByVal=1&p1=1&p2=37&tabMode=dataTable&csid= (accessed March 19 2017) is an update of CANSIM table 102-0511. 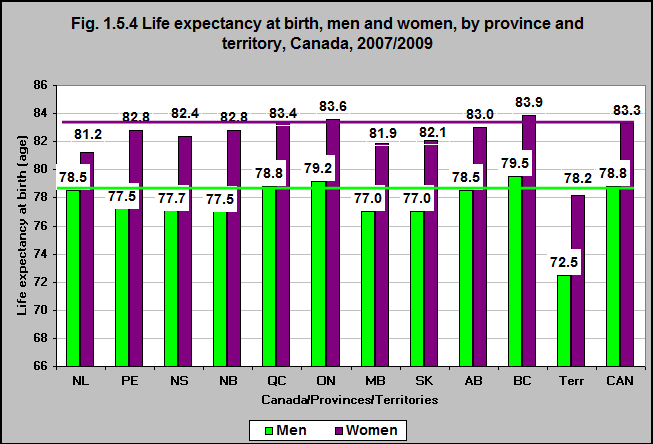 In 2007/2009 the life expectancy at birth varied by province and territory. In BC, women can be expected to live to 83.9 years while in Newfoundland and Labrador that age is 81.2 and in the territories it is 78.2. In BC, men can be expected to live to 79.5 years while in Manitoba and Saskatchewan, they live to 77 years and in the Territories, to 72.5 years.